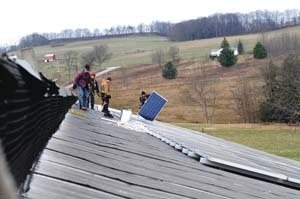 A CREW FROM groSolar installs some of the 138 solar electric panels on a dairy barn roof at the Kays' Farm. From the left: Kyle Neahr and John Gross of groSolar, John Konieczny of Ramsey Roofing and Joe DiPane of Beechwoods Restoration. CALLICOON  For several farmers in Western Sullivan County, the future is now, as they are in the process of, or will be installing solar electric energy systems, thus harnessing the power of the sun to ultimately help get the nation off its dependence on oil. This year, the project is starting to take off as five area farmers have signed letters of intent to go ahead with the installation of solar energy panels on barn roofs. While costing some money out of pocket, this is largely offset by grants, future tax deductions and capital investment in their property  not to mention saving energy and having to fork over less money to the electric company. Of the five farms which signed up, three projects are still pending (Doug and Donna Ackerman of Cochecton, Stefan and Cindy Gieger of Jeffersonville, and Wilfred and Arlene Hughson of Jeffersonville), installation is nearing completion at Bob and Linda Kays’ Farm in Callicoon, and Bill and Carol Diehl’s farm is waiting for the final inspection to throw the switch. The Diehls’ Maple Valley Farm is a 10KW system, while the others will be 25KW solar systems, which, according to Riseling, will generate approximately 27-28,000KW hours, enough electricity to power about four homes, or about 1/3 of the electric energy requirements of a “regular-size” farm. A 25KW solar system consists of 138 180-watt panels, and costs $189,000, but with grants from the federal REAP program (Sullivan County is one of 11 REAP zones in the nation) and New York State Renewable Energy Development Authority (NYSERDA), the farmer is out of pocket about $43,000. SASD’s Farm Energy Project was able to secure $866,000 in grants to get the ball rolling. About 20 days after the 43-day deadline for submission of the applications to get grant money for the five projects, the NYS Legislature passed a law that will allow commercial enterprises (such as farms) to have larger solar energy systems called net metering. “We’re real excited about 2009, because we can do 70-100KW systems,” said Riseling. The solar electric systems are being installed by groSolar. Riseling has owned Apple Pond Farm since 1973, and has been at the forefront of the move toward sustainable/renewable energy. On his farm are a 7.5KW photovoltaic system, solar thermal heating for the home, a straw bale cottage, a truck that runs on used vegetable oil, and a 10KW wind turbine. He’s also setting up a 1.2KW secondary photovoltaic system. So what’s Riseling’s motivation in all sustainable/renewable energy? Bill and Carol Diehl of Maple Valley Farm are waiting to throw the switch on their 10KW 60-panel solar system. “We’ve been living here since my father bought this place back in ’66,” said Diehl as he waited for his wife to return from Sullivan West High School, where she teaches science. Copyright © 1999-2006 Catskill-Delaware Publications.